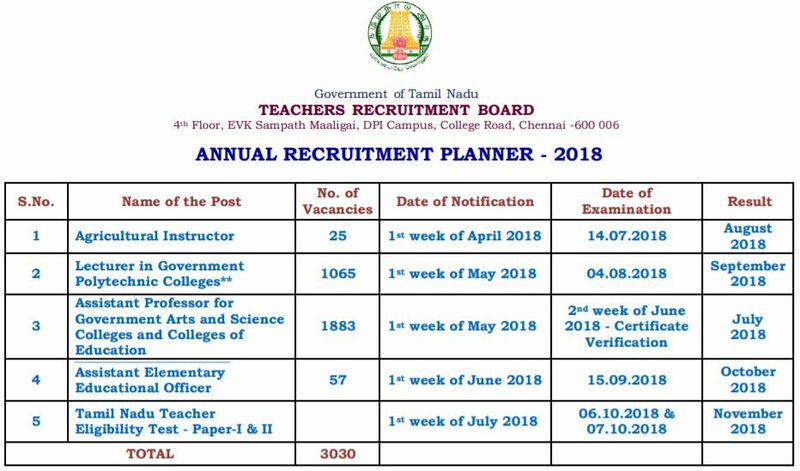 TRB Exam 2018 : The Tamil Nadu Teachers Recruitment Board (TRB) has released the Annual Recruitment Planner 2018 For Tamil Nadu Teacher Eligibility Test (TN TET-2018), Agricultural Instructor, Lecturer in Government Polytechnic Colleges, Assistant Professor for Government Arts and Science Colleges and Colleges of Education, Assistant Elementary Educational Officer. The recruitment schedule has been released for a total of 3030 teaching posts. The interested candidates can apply for TN TET 2018 on the official website – trb.tn.nic.in. 5. Please visit TRB’s website and the newspapers / media for latest information / notifications. when will tnpsc 4 exam result come?